It was my idea about this band that it should be just live, to play, get paid and go home - not to get involved in some of the record deals I'd had in the folk rock era. So what we did was mostly stay in Ireland, in fact we only did two or three gigs in England. We put out a lot of singles - we got these deals with Stoic and Spartan; that's what we did initially. and Phil produced that as well. Then Man of Mine . Midge Ure played guitar and helped Phillip to produce. We did one of these in his studio. He's a very nice person, so nice to work with, so quiet.I remember Phillip wasn't too well at the time. He'd cough into the microphone and say "record that " ! That cough was the start of his illness actually. Our next single was All Is Yellow (Hot Hot Hot). They all got tremendous airplay over here (Ireland) which kept the band going because we got great crowds to our gigs. 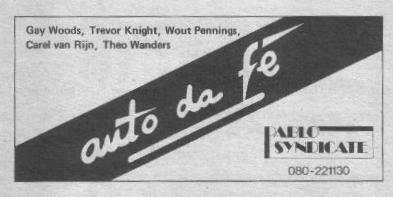 Auto Da Fe did produce a mini-album eventually and later an album proper. The former was named 'Five Singles and One Smoked Cod'. Why ? Before the Irish Auto Da Fe got underway, Gay spent some time living in Holland where the original line-up of the band was formed with Dutch musicians. These two rare adverts come from music papers from the time (around 1980) and appear courtesy of Martin Stassen.